There are a variety of programs that can be offered at schools from grade school to university in addition to what has been outlined above. Deep chant with musical instruments, followed by a question and answer session. This is ideal for a classroom visit (high school or grade school) or assembly. Length: One hour, longer if requested. Multi-Day Cultural Events at Universities (or elsewhere) can last from three to five days. 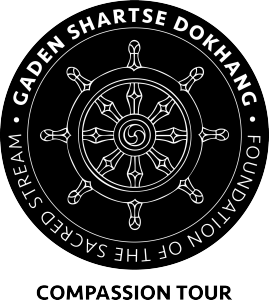 These cultural demonstrations include the creation of a sand mandala, performance of ritual music and chanting, public lectures on one or more of the topics stated above, discussions, and question and answer sessions. The monks will work with children and adults to create traditional sculptures made from butter, as has been done in Tibet for over 800 years. Butter is shaped into Buddhas, Bodhisattvas, flowers, animals, and auspicious symbols. These sculptures are then used to decorate ritual offering cakes made from barley flour. In Tibet, especially during Monlam (the Great Prayer Festival), butter sculpture contests were held among the major monasteries, and were often over twelve feet high! This workshop will begin with a demonstration by the monks and will be followed by the opportunity for each participant to make his/her own butter sculpture. Length: One hour to ninety minutes. For more information or to book the monks for an event, contact info@tibetanmonktour.org.